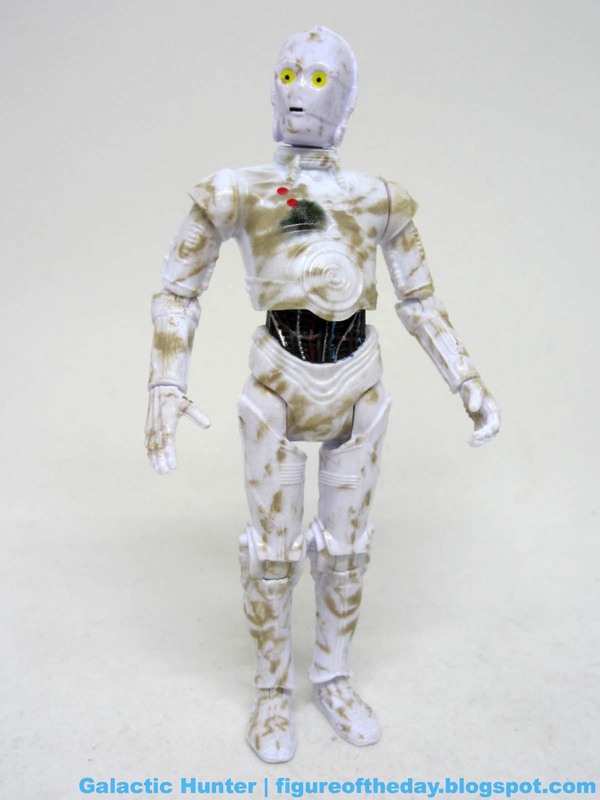 Commentary: We already had a build-a-droid-based K-3PO, but here's another one. 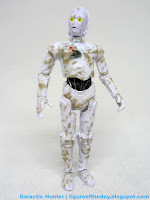 This 3PO Protocol Droid is cast in white plastic and slathered in dusty brown paint, with the famous red dots and a black smudge on his chest. 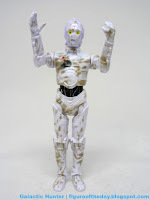 The feet read "CHINA" and "©LFL" once more, with the kind of articulation you saw when Hasbro was throwing 1/6 of a droid in every basic figure. Oh, the good old days. I think team Disney was going for "dirty" and instead got... uh... diaper-accident. 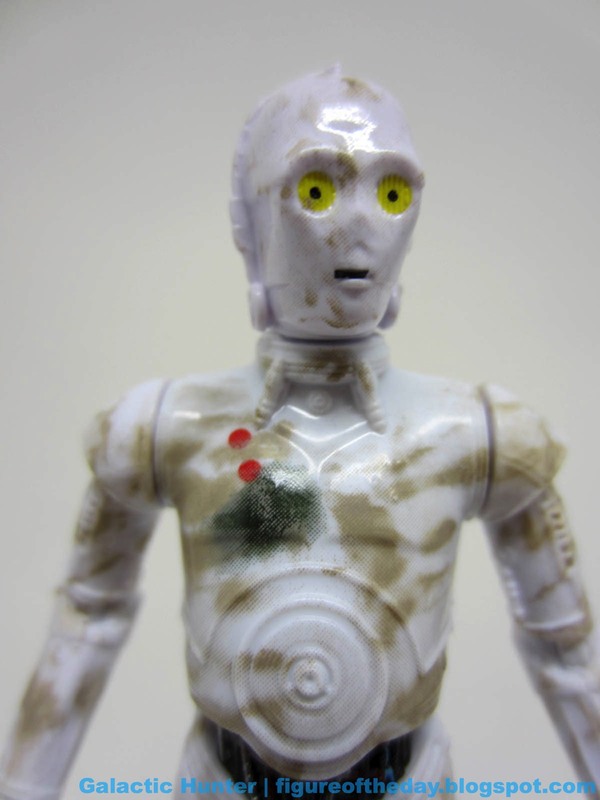 It's clean in spots and smudged in spots, like a finger-painting accident gone horribly wrong. My sample uses the traditional C-3PO mold parts, with an open right hand and a left hand that looks like it could grip something. He has no problems standing, and he can sit somewhere on the lower end of adequate. We've seen better. The arm movement is great, and he can stand well. The yellow eyes have a black dot that adds a little personality, with just a hair more courtesy of the black mouth opening. Kudos, Disney. This was a nice thing to feature, as it really does bring it to life nicely. If you've been collecting at all since 2000, you've had many shots at K-3PO-ish figures. You don't necessarily need this one, but it's distinctive thanks to the brown smudging. If you do the diorama thing it's a must-buy, and if you're droid crazy (and I am) you'll appreciate that the Disney team actually brought out a new twist on something I was sitting here thinking I'd never have a reason to revisit again... short of in the larger 6-inch size. Detailing is good and consistent with Hasbro's, but it's not convincingly Hoth-esque. Maybe you can just pretend he was hanging out in the background on Yavin IV with the other rebels from Rogue One. I'd be lying if I said you should go out of your way to pick this one up, but if you're there anyway and it's available you may as well snag one. Or two!